Last week I wrote about some of my favorite bedding picks for your little ones. In keeping with the theme of bedding, I thought a post on styling beds would be interesting. We’ve all seen the days of big bag 7 and 9 piece bedding and comforter sets on sale and beds decked with matchy matchy pillows and bedding that screams store catalog! And I’m sure you’ve seen enough matchy matchy crib bedding sets too! To me matchy bedding and sets are a beautiful personal space’s biggest nightmare! They take away the element of personal and box you in a category of colors and prints leaving you with a bed that looks right out of a catalog. But how do you achieve that mixed but not matched, eclectic and cozy but not crazy, comfortable and dreamy but not bland look for your bed? Here are my top styling tips for creating a bed that’s not only comfortable and cozy but is reflective of your personal style. If you live in California like me, this might be one of your favorite words and it doesn’t just apply to clothes! The idea of layering your bed with different textiles is a great way to bring in bedding that can transition mild weather changes and also adds great visual interest. Start with your favorite sheets…..you don’t want to skimp here. Get the best sheets you can. 100% Cotton is best and while there is a confusing array of thread counts to choose from…I say feel the sheets and if they feel soft and comfortable to you go for it! Next pick a duvet or a light/medium weight quilt for milder climates and reserve a heavy comforter for the winters. I love the idea of a duvet that can accommodate a lightweight insert for summers and you can switch to a heavier comforter insert for colder climes. 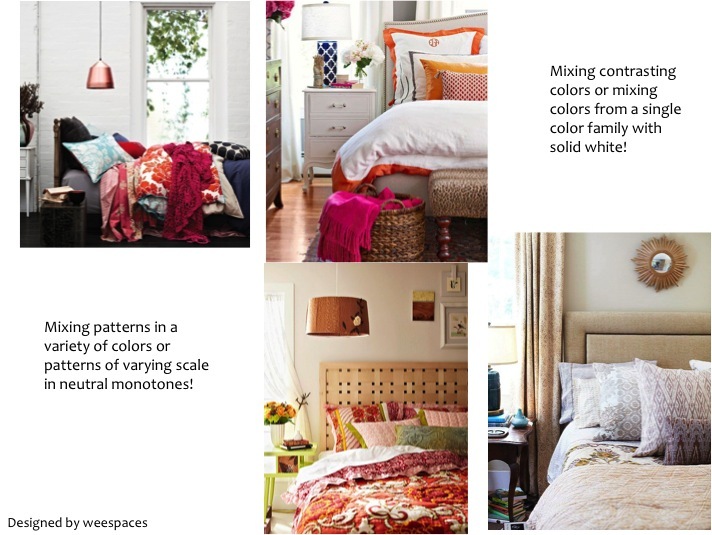 Pillows and throws are another way to add visual interest, color and pattern to your bed. I am personally not a fan of a sea of pillows waiting to be moved before you get comfy in bed. I prefer throwing a couple pillows in different sizes to draw the eye to an interesting color or pattern. One of the keys to creating a styled eclectic bed is finding the right mix of pattern and color. When it comes to colors, it depends on the feel you want in your bedroom. Bold bright colors create a vibrant energetic space…think orange, fuschia, turquoise while softer colors create a more relaxing space like grays, blues, whites and greens. Whatever you choose keep in mind sticking to colors in the same family will help you create a more relaxed calming space while using colors that contrast or are opposites will create a more vibrant bold space. Mixing patterns can be tricky. The easiest way to mix pattern is to stay within the same color family and use patterns of varying sizes. If you pick a sheet set in a small scale busy pattern, then pick a duvet in a large scale bold pattern. When creating or styling your bed keep in mind comfort is key. It’s important to pick the right fabrics, right weight comforters and quilts and the right amount of layer to make sure you stay comfortable. Its important to not have too many layers that add bulk like a fitted sheet, flat sheet, duvet, quilt and a throw on one bed. Not only can it be hard to maintain, it can also make for a rather uncomfortable sleeping experience. So find the right mix that works for you. Similarly while a beautiful vintage throw can add that drama to your bed, coupled with a bunch of throw pillows and a coverlet, it can make for a rather painful process of making your bed every morning! So keep it simple. A few pieces that are easy to play around with and create a bed that looks great and is easy to make. 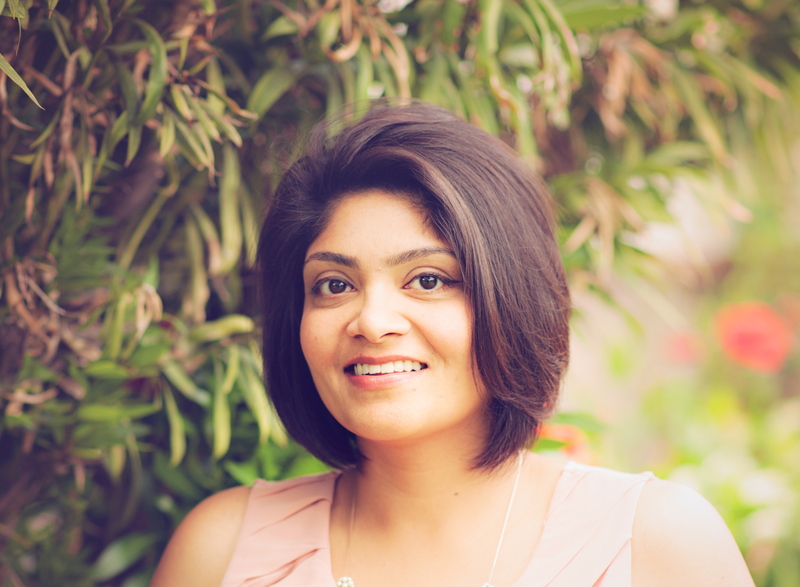 Lastly when in doubt, here are a few tips for that never go wrong fail proof look! – White sheets – You can never go wrong with a set of crisp white cotton sheets! Or a neutral shade of gray or linen! They act as the perfect canvas for that bold patterned duvet or that vintage quilt. – Solid sheets and patterned duvet/comforter or patterned sheets and solid duvet/comforter are safer ways to bring in pattern without overwhelming the space. – Stick with colors closer to each other to create a calming relaxed look and use texture to define your bedding layers. – Bring in colors that contrast with different patterns to create a bold eclectic look. Unify through similar scale patterns and texture. Today’s WeeArt Wednesday pick is the Ice Cream Truck painting by Ieva Baklane a Canadian artist. Such a fun piece of art in any kids space. It evokes all those special child hood memories of ice creams on the beach and summer! The colors and vivid rendition make for such a vibrant and fun piece of art! Favorite Bedding Picks for your little ones! 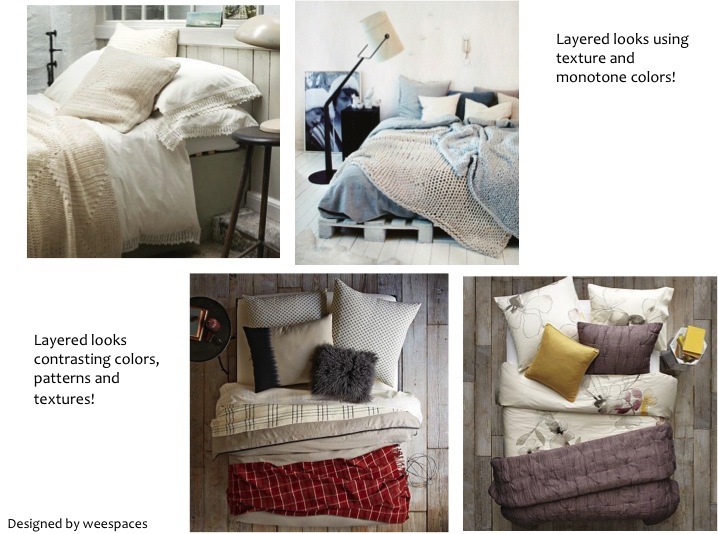 Check out my post at the MLC Blog on some of my favorite bedding picks this season! 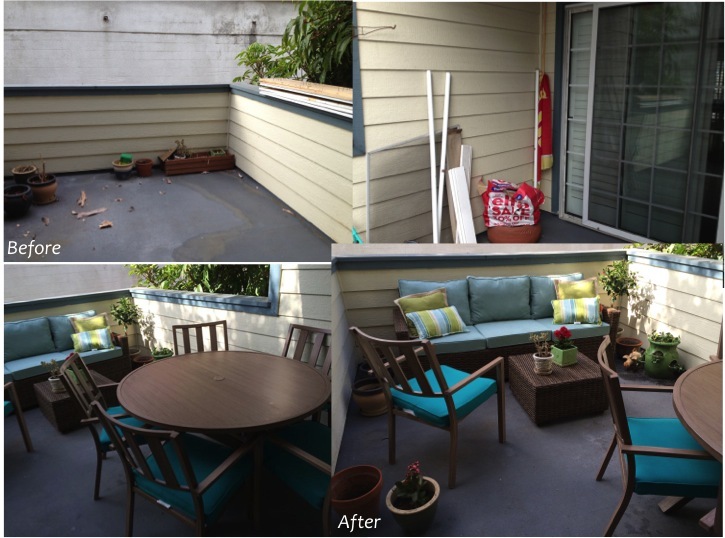 I recently worked on decorating a beachside patio space and here are some pictures of where we are today! Its still work in progress in that there is a lot of styling and soft accessories that are waiting to go in….but most of the furniture is here and what a transformation already! We picked the Pier one Echo Beach collection couch with the Maui cushions and I love the calm blue color. 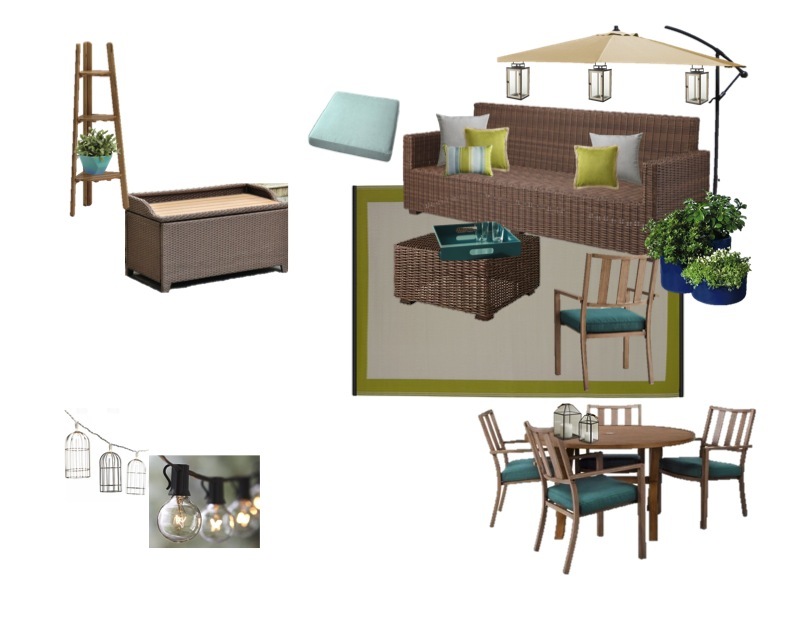 It works beautifully to bring in the calm serene feel of a beach side patio! And I also love the warm wood finish of the dining set. Here’s the design board we finalized. And here’s how it looks with the furniture in. There’s still some work to go into it and I cant wait to share the final pics once we are done with the complete design! One of CB2’s latest addition is this vibrant and beautiful limited edition art print by artist Karla Aguiniga. I love the colors and the graphic geometric dimensions juxtaposed with the softness of watercolors and pastels! It is inspired by the neighborhoods she passed through on her way to school in Tijuana, Mexico. I can see this making a statement in a kids room or even in a family room! Creating an outdoor playspace for your kids! We all know how much fun kids have outdoors and while its great to head out to the park, beach and zoo, its also fun to have a little playspace in your own backyard or patio! And when it’s as easy as these ideas I’ve rounded up, it sure is going to be a hit with parents and kids alike. Whats more fun than hours of playing in the sand! And how fun and easy are these little sand box ideas! I also love how easily all these can double up as water tables or pools too cool off for your tots. All that a kids garden takes is a box/crate to double up as a planter or even a little patch or nook carved out to plant a few favorite veggies. A little veggie garden not only encourages creativity, imagination and responsibility but also makes food more fun for kids! Here are some super easy ideas to create your own. Add a special spot for your tots to lounge in with our pint sized picks! Lounge chairs, picnic benches, swinging chairs, wicker loungers and beach chairs….I’ve rounded up a whole bunch of choices for you to pick from! Marimekko and their prints and patterns are not just fun and colorful but also appeal to the vivid imagination of kids and adults alike! I love their bright and cheerful patterns and this lovely tiger poster inspired by the jungles of Sumatra are just the perfect piece for your tiger loving tot, like mine! The Pink Pagoda shop in Etsy is filled with beautiful pieces of art with a chic oriental accent that you can use in any space in your home. I love their chinoiserie and ginger jar prints. They add a perfect pop of color and an oriental feel to any space. 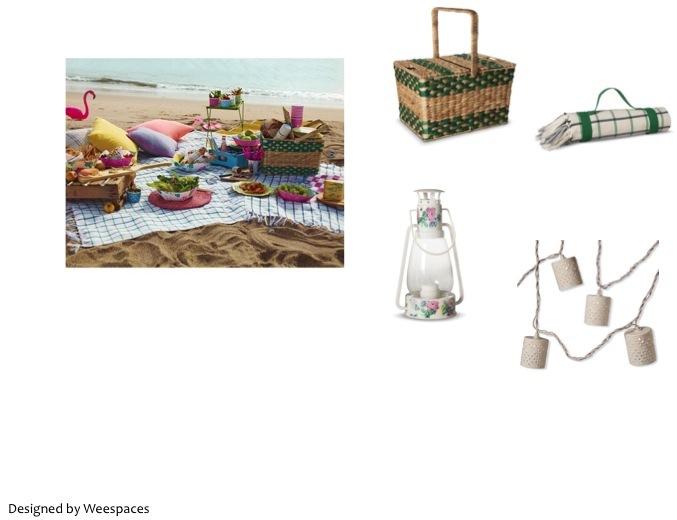 But for our WeeArt Wednesday pick, I chose the lovely Palm Beach Chic Hot Pink Flamingo print! 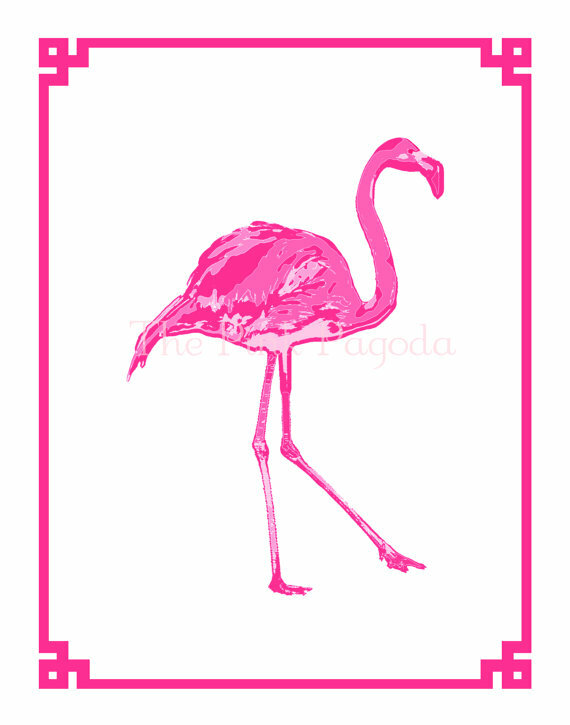 There are flamingos everywhere this season and I can see this liven up a little girls chic room! Its summer and and its time to shift your living room outdoors! Enjoy your dinner alfresco, camp out in the backyard or just set up a picnic at your favorite spot.